After a four month nationwide search and 100’s of resumes received, we were stoked to welcome Tim Pirkey to our team this past January! Born in Phoenix, AZ, Tim was raised in a loving, although full household. As the second-oldest of 6 kids, he learned early on the importance of sharing as well as cooperation and team-work. Both of his parents encouraged and supported Tim’s love of the outdoors with twice yearly camping trips as well as dozens of yearly fishing ‘expeditions’. After graduating from Northern AZ University, Tim began his camp career in San Diego California with YMCA Camp Marston. After a summer camp season followed with a Fall/Spring Outdoor Ed season there, he transferred to Camp Surf, where he stayed for 12 years. While taking on progressively more challenging roles, Tim developed his leadership style while helping staff and participants alike enjoy a safe and fun experience. With multipl e certifications from the Y, including Professional Director, Multi-Team Leader, Child Abuse Prevention Trainer, and Diversity and Inclusion Specialist, Tim has learned to lead with a fair, calm, capable style that lends itself to a learning environment. 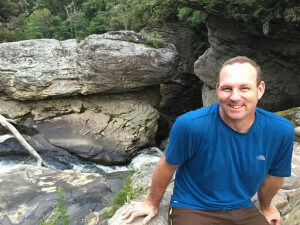 “I am very excited to have Tim lead our management team” said Rick Civelli Founder and President of WB Surf Camp. ” Tim has a unique and very specialized skill set in managing overnight surf camps and training staff on ocean rescue methodologies. He also has a cool disposition which is a great trait to have to foster the professional development of our year round and seasonal teams. His commitment to safety, excellence and customer service will make him a great fit into the culture of our company”. In addition to staff development, Tim has a very strong background in public safety, life guarding and situational awareness. Having been a lifeguard for nearly 30 years, he takes great satisfaction in promoting, teaching and maintaining camper and staff health and safety, particularly in the marine environment. While Tim does require a longboard to surf, he doesn’t need perfect waves, as it’s certainly more about just being out in the water for him. Tim’s other interests include mountain biking, road cycling, swimming, cooking, gardening and reading. He played collegiate club volleyball at NAU while also coaching the team, and has an otherwise extensive coaching background in youth club volleyball. He and his wife Kristie (also a collegiate volleyball player) are animal lovers, with two rescues at the moment, with plans to adopt more in the future.